If you live in or near Portland, you probably know Kazeem Lawal. If you don’t know him, exactly, you might feel like you do. At the very least, you’ve seen him walking down the street and thought, that guy looks sharp. 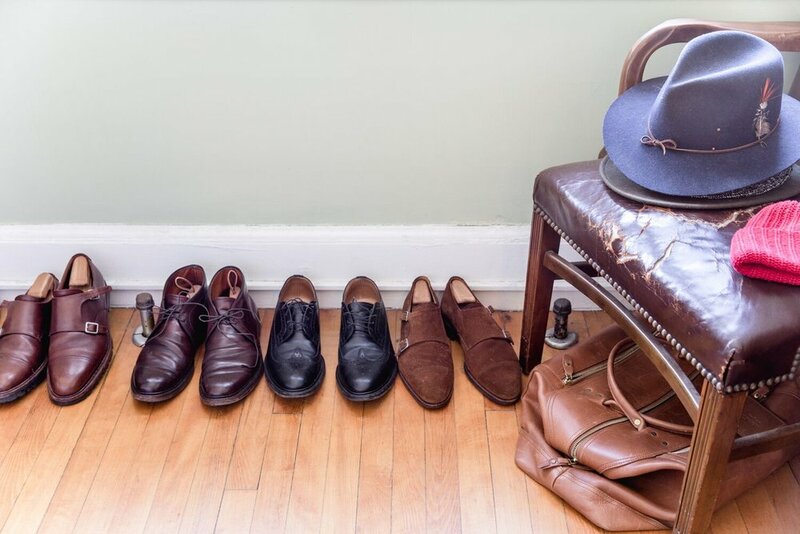 Kazeem curates his clothes and his home the same way he approaches his shop, Portland Trading Co.: clean classics paired with small, interesting pieces that make you look twice. A Mainer by way of California and Nigeria, Kazeem has a style all his own, and a personality that makes him an unofficial mayor of Portland. We sat down to ask him exactly how he pulls together an outfit, and if he has any advice for the rest of us. so why not show that through your clothes, shoes and accessories?" Coffee (for the taste). Tea (to chill). THE MAINERS: Your personal style is strong and distinct. How do you put together an outfit? KAZEEM: I focus on tailored, clean and classic, but with a little touch of something unique. A hat, a bandana, a vintage lapel pin, et cetera. THE MAINERS: What advice would you give someone who wants to up their game in terms of style and clothing? KAZEEM: Fit. Fit. Fit. Not skinny, but tailored. I see a lot of people, mostly men in fantastic shape, wearing a full size or more above their true size. I also tell people to accessorize more. As human beings we are all different, so why not show that through your clothes, shoes and accessories? Bottom line, be comfortable and build your confidence. And proper posture, always. THE MAINERS: So you’re an advocate of the tailored look. Do you remember your first properly tailored outfit? KAZEEM: My first year of boarding school, my mother took charge of getting my uniform ready. I was twelve years old and I was growing like crazy. So my mother decided to get me polyester shorts with an elastic waist line and a boxy shirt so I could grow into the uniform, and we could save money. It was a disaster. The polyester fabric made too much noise when I ran, it was too hot, and the fit was not a good look. So the following year, I asked for cash, went to the fabric market, purchased fabrics, took them to the tailor, and the rest is history. KAZEEM: I was raised in Lagos, Nigeria. THE MAINERS: How did Nigeria influence your eye and style? Beyond having bespoke school uniforms, which I love. KAZEEM: In the culture I was raised in, part of the Yoruba Tribe in Nigeria, how you carry yourself—your clothes, your scent, the way you talk, the way you walk, overall grooming—all of these things are crucial aesthetics and influence how you are analyzed in the larger society around you. So those things are the foundation on which my eye and style are based. THE MAINERS: Was anyone in your family especially influential, in a positive or negative way? KAZEEM: If I was born with any style, I will say my mother is responsible. She has style, she has presence, she has the smarts. Sloppy is not accepted in her home. Being sharp is everything, even down to how you chew your food. Elegance was always in our home. THE MAINERS: How did you come to Maine? KAZEEM: I was on a self-discovery adventure via starting a business in Lagos. The company I created didn’t quite work out as planned, so I put my resume online and a large company hired me and brought me to Maine. And here we are—Kazeem living in Maine. WOW! THE MAINERS: Once you were in here, what kept you in Maine? KAZEEM: So, the company that brought me here filed for bankruptcy and a bunch of us got laid off. I was also in a relationship then. So I decided to stay and create something new and fresh. That’s how my store, Portland Trading Co, was created. "If I was born with any style, I will say my mother is responsible. She has style, she has presence, she has the smarts." THE MAINERS: You have two teenagers; do they follow your example when it comes to personal style? KAZEEM: They love the tailored look. I tried pulling my mom’s move on my son—a larger size for him to grow into and he said, “HELL, NO.” He won because I remembered how I felt. THE MAINERS: Can you tell us about the outfit you’re wearing now? 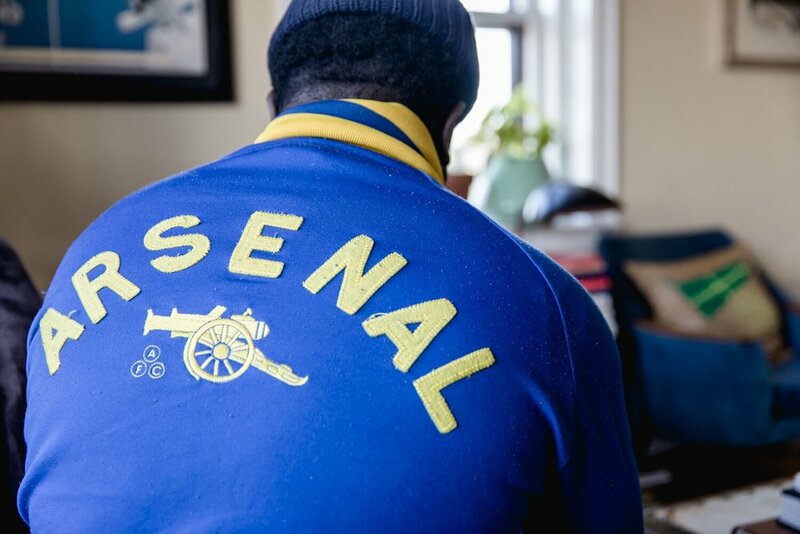 KAZEEM: I’m wearing a vintage Arsenal tracksuit I bought fifteen years ago in New York City. And a beanie we sell at Portland Trading Co. THE MAINERS: Arsenal is a Premier League football team in London, for those who don’t follow the sport. Soccer for us. Is Arsenal your team? KAZEEM: I’m a huge Arsenal fan. THE MAINERS: What about vintage? How do you find your pieces? 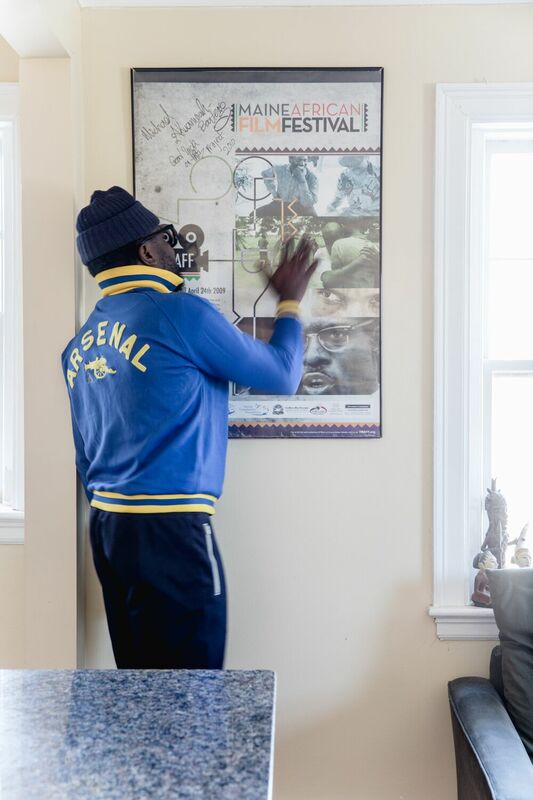 KAZEEM: My main source for vintage is in Boston—the legendary store Bobby from Boston. The late proprietor, Bobby was a mentor and dear friend. But I don't acquire things like I used too, just little things now—bandanas, rings, pins, watches, et cetera. 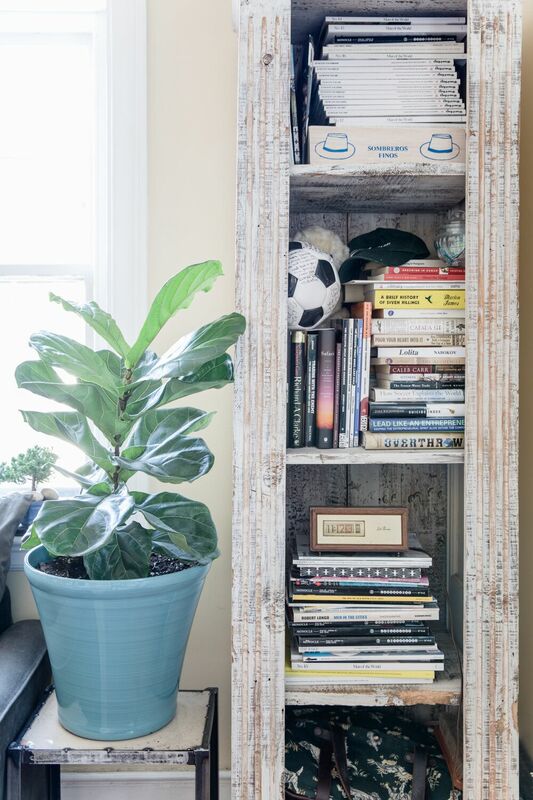 THE MAINERS: We’re in your lovely home; how do you go about creating an interesting interior space? KAZEEM: My approach is minimal, minimal, minimal. Just couple of art pieces, a sound system, a great bed, high quality bed sheets, and a few plants. When I travel, I try to bring back a piece that reminds me of the beautiful, wonderful times I had overseas. Ultimately, one should strive for space that brings peace and gentleness. So when one comes home, there’s a sense that everything is going to be okay. 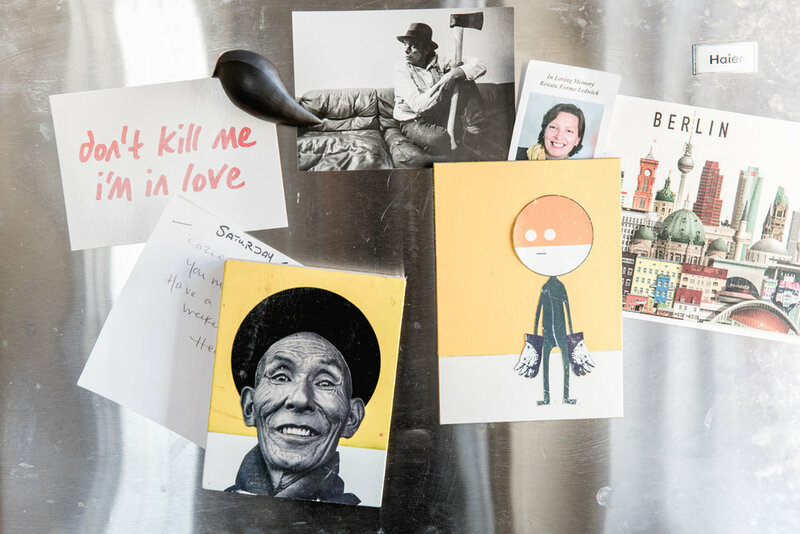 THE MAINERS: Do you have a favorite find from your travels? KAZEEM: A vintage French print purchased on my first solo trip to Paris. I discovered it wandering around Paris, getting lost, and stumbled on small antique book store. THE MAINERS: Do you have any upcoming travel plans? 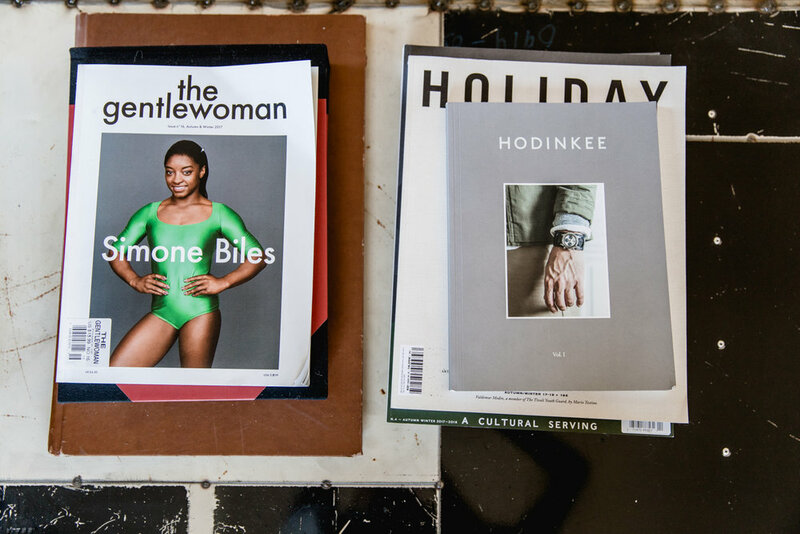 KAZEEM: I try as much as possible to travel overseas to areas known for their sense of minimalism across every aspect of life—style, home, on the streets, in stores. Last year I went to Berlin. And hoping and praying I can make it to Japan this winter. THE MAINERS: Any advice for surviving the winter deep freeze? KAZEEM: Go to Pai Men Miyake. Order the pork buns, Brussel sprouts and Tokyo Abura. THE MAINERS: That’s good advice. We’ll take it.